Jack Cat and Stella Calico and I have been apartment dwellers through this school year, and it has been an adjustment for all of us. I love my apartment. I am eternally grateful for it. I am eternally grateful for the wonderful job that had me moving to an apartment this year. I am also happy to have spent this week back in my house. Jack Cat concurs. Stella Calico has spent the week sitting on couch cushions while she recovers from being spayed. I think she’s happy to be here but not as happy as Jack Cat. Today I sat in my backyard and watched Jack Cat hunt bugs. He had a great time, and I did too. The sun was shining, the wind was blowing, the peach trees were blooming, and the cat was frolicking. I was just sitting and taking it all in, but I loved it. I had a profound sense of rightness in it all. I had a profound sense of my own connection to the divine. I was doing nothing more than sitting in a lawn chair by myself, but I was happy. 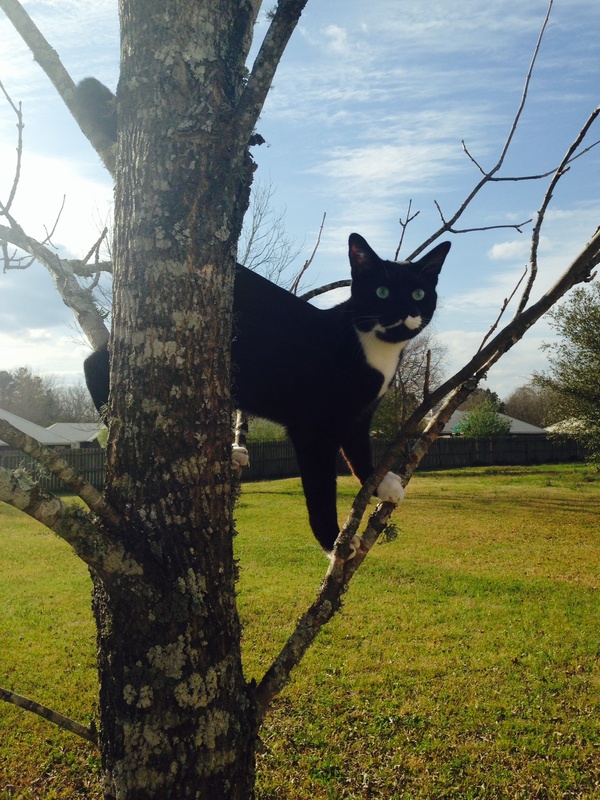 God was in his Heaven, Jack Cat was climbing trees, and all was right with the world. Last year around this time, I doubt I would have been capable of finding this kind of happiness in something so simple. I doubt I would have been capable of finding it at all. I wasn’t happy this time last year. I was deeply unhappy and looking for ways to change my life. Last year around this time, I wasn’t happy, but I was spending a lot of time praying about what to do about it. In particular, I remember praying for miracles. I prayed for miracles for myself and for my friends who were in the same or a similar situation. A lot of miracles happened in the spring and summer of last year. Doors opened for me that I didn’t anticipate. Roads were paved for me. Everything I needed to change my life worked out in just the way I needed. One thing that happened, though, was that one of my friends introduced me to a book called A Course in Miracles. I was praying for miracles for this friend. I had not told anyone that I was praying for miracles. Then the person I was praying for gave me a book meant to teach what miracles are and how to find them in life. I considered that to be pretty miraculous in and of itself. One of the main things that A Course in Miracles teaches is that miracles are changes in perception. Miracles are not so much material gains as they are corrections in perception about what we already have. Miracles are the removal of fear and doubt to make more room for love and faith. Miracles are acts of forgiveness and compassion. Miracles are feelings of connection rather than disconnection. Miracles resolve inner conflict and bring harmony into a life and therefore into the world. Miracles are acts of service to others. Miracles are acts of reconciliation. Miracles are recognitions of the light of God inside and outside the self. Miracles are changes in gratitude. I feel like I’ve experienced a lot of miracles this year. Not the least among them is the simple ability to sit quietly alone in my own yard doing nothing more than watching my cat chase bugs and feel very, very blessed to be there. Like most people, I can be pretty stubborn. I had to leave my house to learn how to be truly happy in it. I’ve had to leave a lot of other things behind as well this year. The changes in my life have been good, but they haven’t all been easy. At times I’ve felt like I’ve finally understood the story of Lot’s wife. If you spend too much time looking back, you will petrify yourself with your own tears. The Greeks gave us the story of Niobe who was turned to stone in her grief for her lost children. Regret has its price no matter what culture you come from. The living move forward not backward because that is the only direction that life flows in. Sometimes, even if it is just for one week, forward takes you right back where you were, however, but the beauty of this is that it’s a whole new place by the time you come back around because you are a whole new person. The only thing real is love, A Course in Miracles says. The only time that is real is now. The only way to live in the now is to forgive yourself and others, let the love of the Divine in, and look around to see how truly blessed you really are.